Rissani is a small oasis town in Morocco that lies near the northwest edge of the Sahara. In Rissani if you don't have your own car it's CTM. The CTM bus leaves the Fez bus station at 9pm. You will get into Rissani around 6AM. From there you will need to take a taxi to Merzouga. From Fes to Rissani it costs 150 dirhams (MAD). There's also the regular bus (100dh) from Fez that arrives at 4:30 AM. Rissani is small enough that you can walk most places; from the bus station (gare routiere) to the gran taxi stand for Merzouga, for example. when you are in Rissani city there are a lot of things to see and to enjoy your time too and many surprises waiting for you and many questions come to your mind. in Rissani you can see : a lot of ksours for examples Moulay Ali chérif mausoleum: When you go through the big gate ornamented by green ceramics and topped by a dome you will find on your right the big room that shelters the tomb of moulay ali cherif. The first founder of the Alaouite dynasty. This mausoleum was rebuild in 1965 after having been destroyed by a rise in the water level when the ZIZ river was in spate the sacred precinct has a wide yard, a patio and picturesque mosque . Ksar el fida: It s situated at about 4 km on the north east of Rissani its the most important and at same time the most ancient of the alaouite ksars in the Tafilalet however. Its worth mentioning that the genesis of the ksar dates back to the reign of king moulay Ismail to house his son king moulay abdellah, but the ksar was reduced to rubbles and ruined except for the high outside walls and the tours which were built of muddy earth. The ksar was rebuilt under the reign of moulay abd al rahman but this time at about eight hundred metters at south east of the first site. 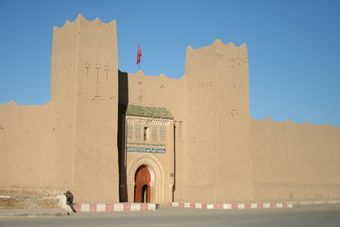 Ever since the ksar had preponderant roles in directing the policy of region and at times its served As residential palace of the Khalifa or Caid of the Tafilalet and this up to 1965. Henceforth the ksar was a Makhzanean domain and is still an architectural patrimony. Visit the 3 day weekly Rissani souk (market) - Sunday, Tuesday, and Thursday - meet wandering traders, nomads, Berbers and Arabic desert dwellers who come to sell all kinds of clothing, wares, plants, spices and vegetables, and animals. You can see what wild plants people gather and use as medicine; plus the sheep market, donkey market, and bird market. You can buy fossils stone i mean ammonite orthoceras and small decoration. Better to drink mineral watter Sidi ali or Sid hrazem or Ciel .The Max price of a bottle is 5 or 6 dirhams. A bottle of water (this is not mineral water) Ciel 1 liter costs 5,00 DH. Don't pay more! Hotel Merzouga (close to the souk) for 150 DH per night / double room. Clean, hot shower, friendly. Small garden in the backside, where you can relax from the day. Kasbah Ennasra, 2 km before the town on Rissani Road. Tel +212.535.774403, Email: [email protected] The hotel provide a/c, wifi, swimming pool and organizes excursions by Toyota to the Erg Chebbi dunes and also bivouacs. Price from 35,00 Euros, Double from 60,00 Euros. Like many small towns in this region, a major source of income are tourists. 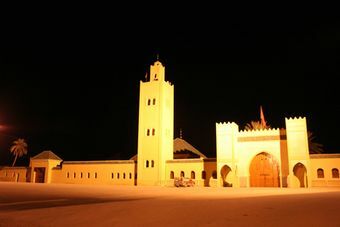 Many tourists come to Rissani with the intention of spending a night or more in the pre-Saharan Desert. That being said, you will have to contend with some fairly aggressive touts that pounce upon tourists the moment the bus stops. This is particularly noticable when arriving by CTM because you are dropped off in the medina rather than the bus station. If you don't want to be hassled from the moment you arrive, it would be a wise decision to find a reputable tour operator prior to arriving in Rissani. Explain to them exactly when you will be arriving and try to arrange for them to meet you at the bus. This will hopefully alleviate much of the hassle. However if you would prefer to do things the old-fashioned way (and admittedly more exciting and adventurous) and simply show up, you can usually rid yourself of the touts by issuing a polite (but firm) "La, shokran" to them. Remember that no one is going to harm you, so keep smiling and stay relaxed. And enjoy your amazing trip into the Sahara!! Nearby Erfoud (10dh by gran taxi) may give you more options for traveling to other destinations. This page was last edited on 18 November 2015, at 14:20.